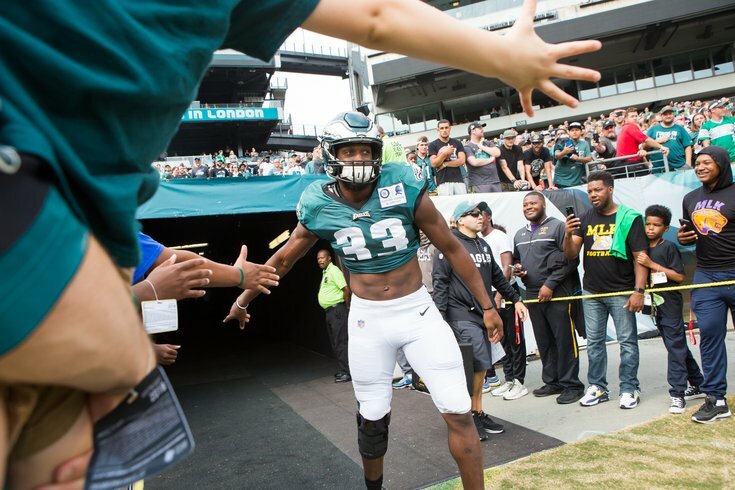 Josh Adams walks onto the field at the Eagles public practice on August 11 at Lincoln Financial Field. Tonight, the Eagles will face the Browns in the penultimate game of their preseason slate, and arguably their most important of the summer as several key roster battles could be decided on both sides of the ball. And after facing the AFC's best from a season ago in a Super Bowl rematch with the Patriots last week, the Birds will see the opposite end of the spectrum as they visit Cleveland and an 0-16 team that features a familiar face in Mychal Kendricks. While the Browns have gotten a lot of press the summer, especially in recent weeks since HBO's "Hard Knocks" premiered, it's the Eagles who still rule the NFL as reigning champions. Will they impose their will on the upstart Browns, or will Cleveland, out to prove that they're no longer a laughingstock, get the better of the Birds in this one? The answer is, it doesn't really matter because it's the preseason. The final score is meaningless. Here, I'll prove my point: The Browns are three-point favorites. Nick Foles and the "starting" offense — the quotes because so many of the actual starters will be out for this one — are expected to see the entire first half tonight. And since we include total points here each week, we figured it would be worth it to cut it off at halftime, since the first half will be the only part of the game when it'll be worth even considering the actual score. The Eagles have struggled offensively quite a bit the preseason, especially early on in games when their better players were in, with just 21 first-half points over their first two games. With so many starters out against Cleveland — and that includes Carson Wentz — it's hard to imagine the Birds putting up a ton of points against a Browns defense that can get to the quarterback. That being said, I think the two teams can combine for couple early touchdowns — and look out for one on special teams or defense — in the first half and post 24-27 total points in the first 30 minutes. When you're the reigning Super Bowl champs, the things that seem important in the preseason are very different than when you're coming off an 0-16 season. That's why Eagles fans have the luxury this summer of worrying about things that may seem petty to other organizations, like the battle for the fourth running back spot. That's been one of the big roster spots to watch this offseason, and on Thursday night, local product Josh Adams (CB South) should get his best chance yet to prove he deserves a spot on the 53-man roster. He's going up against Wendell Smallwood, Matt Jones and Donnel Pumphrey, who will miss the Browns game with a lingering injury. And with Jay Ajayi, Darren Sproles and Corey Clement all sidelined on Thursday night, it's a sage bet we'll see a healthy dose of Adams, an undrafted rookie out of Notre Dame. After recording 30 yards on six carries in the preseason opener, Adams was sidelined against the Patriots with an ankle injury. If he's 100 percent, and the Eagles aren't afraid he'll re-injure his ankle, there's a good chance Adams gets more than enough carries to hit 40 yards. Will he? He better. His spot on the Eagles' roster likely depends on it. A turnover-free first half of football would be a huge confidence boost for the Eagles after a sloppy showing against the Patriots, one that included a strip sack returned for a touchdown. I think Nick Foles is capable of that tonight, assuming his running backs hold onto the ball. That means Nate Sudfeld and Co. need to keep it under three in the second half. Let's hope they can do that. The Patriots recorded eight sacks last week against the Eagles. Eight. Even if the Eagles' offensive line gets it together and cuts that number in half, it'll still be too many. I'm taking the over, only in the hope that it includes a mention of that footage (it definitely won't).